Manchester University’s students’ union has become the latest student body to vote to replace applause with “jazz hands” in an attempt to make events more accessible for people with disabilities. At its first meeting of the academic year, the union voted to use British sign language clapping, which involves waving your hands in the air, instead of audible clapping, at events. “This union notes that since 2015, the National Union of Students (NUS) has been using British sign language (BSL) clapping (or ‘jazz hands’), as loud noises, including whooping and traditional applause, can pose an issue for students with disabilities such as anxiety or sensory issues,” the motion read. The union resolved “to swap audible clapping out for BSL clapping at SU events in order to make them more accessible” and “to encourage student groups and societies to do the same, and to include BSL clapping as part of inclusion training”. In a statement, the union said that the vote did not constitute a ban on clapping and that BSL applause would be used at democratic events and not gigs, theatre productions or sport. They said: “Inclusivity is one of the students’ union’s founding principles. We recognise that minority groups are underrepresented in political environments and we are working to address that. This policy is one way of doing so inside our union. The NUS voted to start using BSL clapping in 2015. Speaking at the time, Nona Buckley-Irvine, the then general secretary of the London School of Economics students’ union, told the BBC: “Jazz hands are used throughout NUS in place of clapping as a way to show appreciation of someone’s point without interrupting or causing disturbance, as it can create anxiety. A spokesperson for the British Deaf Association said it welcomed any steps to make events more accessible for deaf and disabled people. “Sign languages are languages within their own right, with their own grammar, syntax and idioms,” the association said. I thought that BS was made up. Insane childish politically correct c*ap. 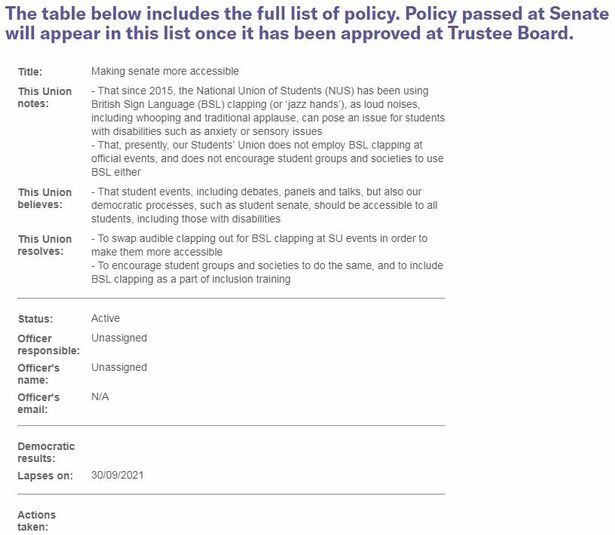 So Manchester Students’ Union hates BLIND people do they? If those posing politically correct children want to blow some hot air about ‘disability’ is garbage about “clapping” the best that they can manage? Yup Manchester Students’ Union HATES BLIND people. That BS is a total distortion. People can be “registered” as – severely sight impaired/blind or sight impaired/partially sighted.